Kokedama or moss balls are the newest gardening craze. Simply form some moss and mesh into a ball around a plant rootball and hang from a string or rest in a dish for a globular garden. But how do you water a kokedama arrangement? 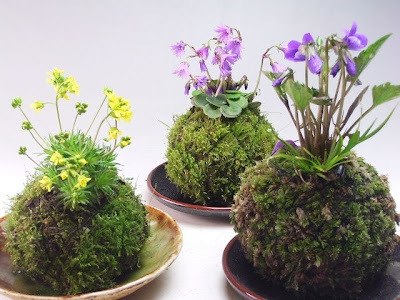 Here is a kokedama watering tip from fleurametz.com, be sure to visit their site for more tips on how to build a kokedama or moss ball. "If you want to water the plant, simply do this my submerging the ball of moss into a bucket that is filled with water. The ball of moss is saturated after all the bubbles disappeared. Give it a small squeeze to remove the excess water."